Manchester Pacific Gateway is strategically located on Broadway and Harbor Drive on the North Embarcadero of the San Diego Bay. This prestigious location is directly across from the USS Midway Aircraft Museum, adjacent to the Cruise Ship Terminal, and within 2 miles of transportation including the San Diego Airport, Amtrak, Coaster Commuter Train, and San Diego Trolley. Manchester Pacific Gateway is truly the gateway to San Diego, and will become a thriving hotel, office and retail destination featuring award winning restaurants, entertainment and nightlife venues. This development will connect the waterfront to downtown’s Central Business District, providing San Diego a dynamic world-class work-play location that will activate the Western Waterfront and attract visitors from all over the world. Discover the local neighborhoods. 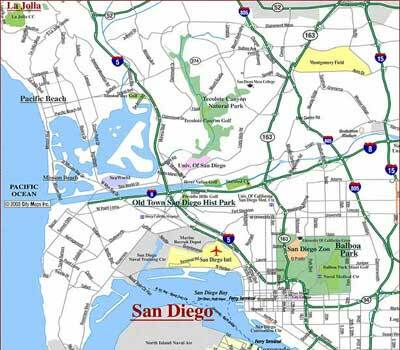 The streets and highways of San Diego reflect the auto-oriented development of the city as well as its "urban sprawl" historic growth pattern. Major freeways were built and repeatedly expanded to serve the needs of commuters coming into the city from the suburban regions of North County, South Bay, and East County, as well as the Tijuana metropolitan area. 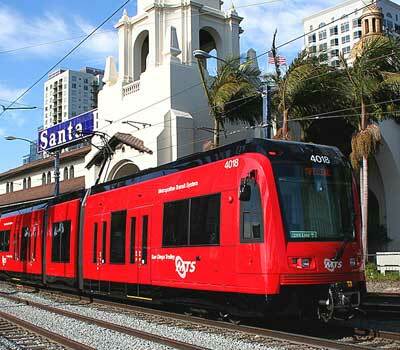 The Trolley serves historic Old Town, Mission Valley, Fashion Valley, Petco Park, and Qualcomm Stadium, among many other popular San Diego destinations. The next phase will service UCSD and UTC. The system operates over 53.5 miles on three routes; mostly double-tracked with 53 stations. (Routes: Blue Line, Orange Line, and Green Line). 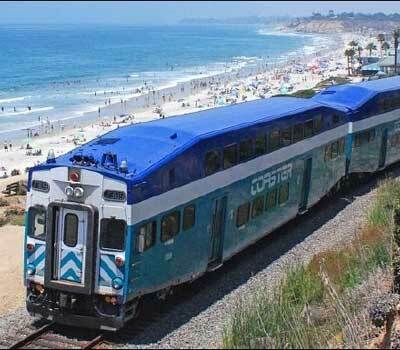 The COASTER commuter train provides breathtaking coastal scenery as it runs north and south through San Diego County, serving eight stations between Oceanside and downtown San Diego. More than 20 trains run on weekdays, with additional service on the weekends. It takes about an hour to travel the entire COASTER route. The Los Angeles-San Diego-San Luis Obispo (LOSSAN) rail corridor runs through six Southern California counties. Plan your next trip with the LOSSAN timetable, which combines the schedule of COASTER commuter trains, Amtrak intercity trains, and Metrolink commuter trains. The Pacific Surfliner offers twelve daily round-trip services between San Diego and Los Angeles, and between Santa Barbara and San Diego. 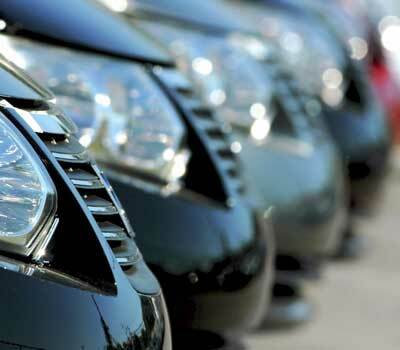 Whatever your travel plans are, you're sure to find a departure time that meets your needs. 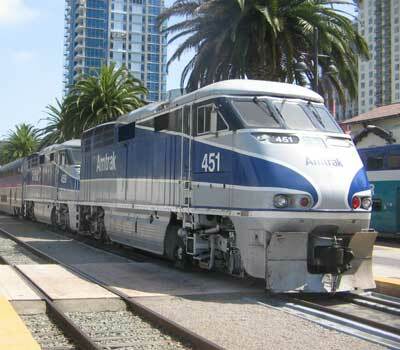 If you are traveling between San Luis Obispo, Santa Barbara, Ventura, Los Angeles, Orange and San Diego counties, use the Southern California Passenger Rail Timetable combining the schedules of the Amtrak Pacific Surfliner, Metrolink and COASTER commuter trains to plan your trip to cities and towns not served by your primary rail provider. 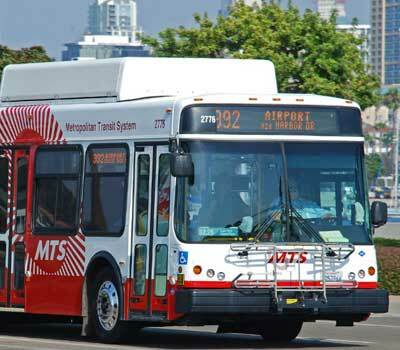 MTS operates 94 fixed-routes in southern San Diego County with a fleet of 797 buses. 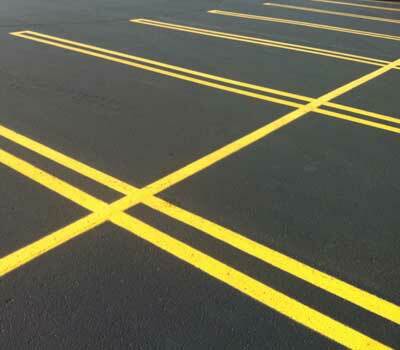 Twenty-four routes are directly operated and 70 routes are operated by private contractors. 54,914,063 fixed route and 417,717 MTS Access riders in 2014. MTS Bus operates 1,350 route-miles over a 716 square-mile service area, with a combined population of more than two million people within the cities of San Diego, Chula Vista, Coronado, El Cajon, Imperial Beach, La Mesa, National City, Lemon Grove, Poway and Santee, as well as the County of San Diego. MTS bus routes connect with North County Transit District (NCTD) bus and rail routes as well as the San Diego Trolley. 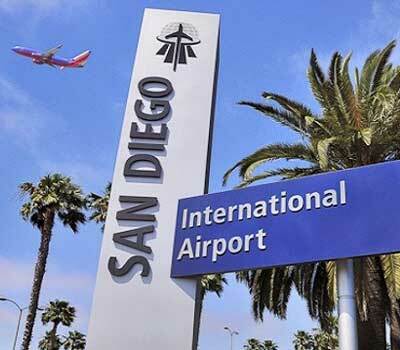 San Diego International Airport (SAN) is open twenty-four hours a day. Each airline has its own operating hours, but typically ticket counters are staffed by 4:30 a.m. for check-in. The airport supports an average of 525 operations per day, serves approximately 18.8 million passengers per year, and has 24 passenger carriers and 5 cargo carriers. 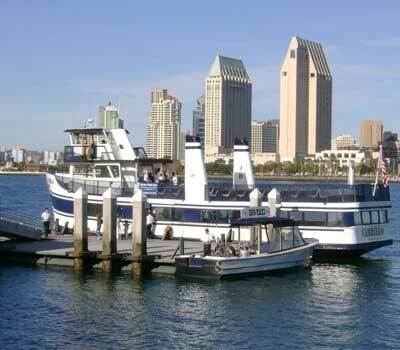 Ferry Service from San Diego to Coronado begins at 9:00 am from San Diego and leaves every hour on the hour. Ferry Service from Coronado to San Diego starts at 9:30 am and runs every hour leaving on the half hour. Last Ferry leaves San Diego at 9:00 pm Sunday through Thursday; 10:00 pm Friday & Saturday. Last Ferry leaves Coronado at 9:30 pm Sunday through Thursday; 10:30 pm Friday & Saturday.